There will be cloudy skies over the city today with the possibility of showers this evening. The high will be a pleasant 72° with the low tonight near 58°. Jews around the world are celebrating their New Year today or “Rosh Hashanah”. In synagogues around the city the shofar (a ram’s horn) was blown as part of the commemoration. At Rodeph Shalom Synagogue, Broad & Mount Vernon Streets, Rabbi Henry Berkowits urged the celebrants to remember their loyalty to America at home, at work, and in social gatherings. Ten thousand people jammed into Franklin Field today for the 14th annual police athletic carnival. The honored guests at the event were 32 wounded soldiers from the Lakewood N.J. hospital. The men were greeted with a standing ovation which continued as they entered the stadium and took their seats. 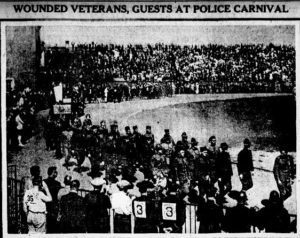 Then the games began with the police-athletes competing in a variety of events including the 100 yard dash for older policemen with at least 20 years of service, a 100 yard dash for policemen weighing over 250lbs., the 120 yard hurdles, a high jump, a mile walk in full uniform, a mile run, a 440 yard dash, a 220 yard dash and a sack race. After the 7th event the soldiers who could walk paraded around the field while those who could not were driven in automobiles. The marchers were accompanied by the police band and received another standing ovation from the appreciative crowd. They then left the field to board a train and return to the hospital. In Washington, D.C. last night the Senate passed a measure which will shut down every brewery in America as of December 1. The bill provides that the manufacture of beer and wine be stopped until all American troops are demobilized at the end of the war. Under the bill the President can use his authority under his war powers to prohibit the manufacture of beer as of December 1 and wine as of May 1, 1919. Those supporting nationwide prohibition see the measure as a first step toward outlawing all alcohol production. The distillation of whisky was prohibited last year as a food conservation measure. Locally, the law would force the closing of 40 breweries here and the loss of over 2000 jobs.